Get your calendars out and circle Friday, April 26th, 2013 as Pretzelmaker® celebrates its yearly tradition of giving away Free pretzels on National Pretzel Day. This year, they are twisting up the fun by asking customers to tell their favorite joke and receive a free soft pretzel (standard salted or unsalted) while supplies last. 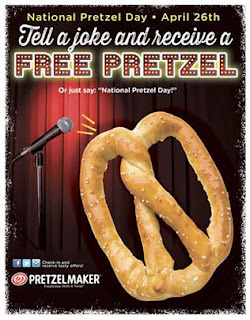 If you lack a funny bone, don't worry, you can simply say "National Pretzel Day" and receive a free pretzel, but it won't be as funny!